In Virginia, 19-year-old Bailey Belcher was driving home when he noticed smoke coming out of his mother’s Kia Soul. He pulled over and got out of the car. Five minutes later, the entire car was engulfed in flames. Without explanation, the family says that the car had been reduced to a skeleton of its former self. But the dealer is still billing them for monthly car payments. Still, they are relatively lucky, compared to other drivers. In Oklahoma, Kelly Nash is mourning the death of his brother, who was running errands in his Kia Soul last year when his mother suddenly heard an explosion outside her apartment. She struggled to free her son from the car, but the doors had automatically locked, trapping him inside, Nash says. "I would like answers to the reasons why this happened and why my brother lost his life at the age of 48 years old," Nash told the local news. KIA apparently investigated but didn’t give him many answers. 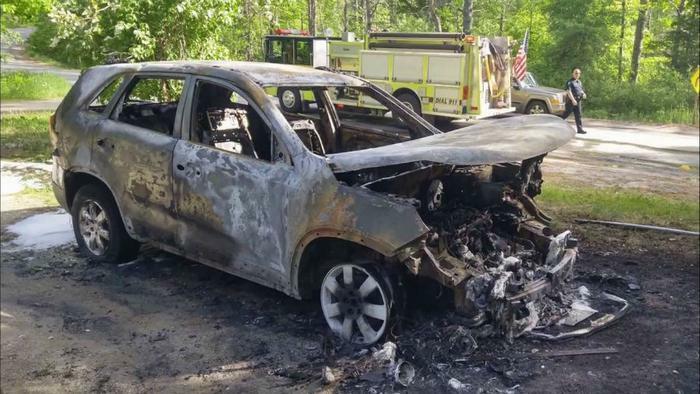 "KIA came in, and they had an investigator, and they determined that it did happen somewhere in the motor, but they could not determine exactly where it happened at in the motor because it was too charred,” he said. The Center for Auto Safety last month counted over 200 complaints that consumers had submitted to the National Highway Traffic Safety Association (NHTSA) describing similar scenarios of cars that suddenly went ablaze without warning. The safety group petitioned the agency to issue a formal recall and said the complaints were linked to certain models of both Hyundai and Kia cars. Both brands downplayed the findings at the time. But a spate of recent horror stories about safety defects “including fires” that consumers are now sharing, as well as some help from a Senator, seems to be spurring federal regulators to finally take some action. NHTSA on Friday sent a letter to Sen. Bill Nelson, a Florida lawmaker, who took up the cause to get the cars recalled, saying that they counted a total 402 fire complaints. The fires occurred both with and without prior collisions, though the agency didn’t provide a more detailed breakdown. Asked if the agency was investigating such fires, NHTSA told the senator that it would include non-collision fires in an ongoing investigation into engine failures, a separate defect plaguing the Kia and Hyundai cars. The allegations of unprompted fires and the lax response is part of a disturbing trend in the automotive industry. Advocates say that carmakers are downplaying reports of serious safety defects in their vehicles, portraying issues like fires and poisonings as “service” issues in an effort to avoid an expensive recall. It’s a practice that advocates say has grown more common in recent years. In another unsuccessful battle, the Center for Auto Safety has also been demanding a recall of certain Ford Explorers, which have been linked to over 1,000 complaints of carbon monoxide poisoning. Ford later agreed to fix the issue for free if customers have “concerns,” but it has refused to issue a formal recall.